A unique Raspberry Pi notification system has been published to the Hack A Day website by member Tobias Kuhn, which provides full instructions on how to create your very own notification device. 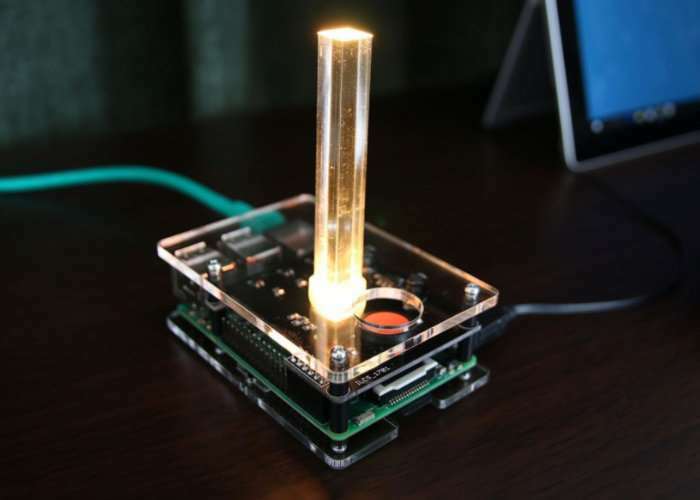 Watch the video below to learn more about the project and see the notification device in action which is aptly named the Crystal Signal Pi and uses a Raspberry Pi mini PC which is connected to the local network using a static IP and is running an Apache web server. This Project is about a small circuit board and custom Raspberry Pi case combination which allows you to turn your Raspberry Pi into a notifier device. It all started with keiko-chan. I work in a company with some servers and the need to keep up with errors or any kind of emergency situation that might occur on said servers. And a product called keiko-chan (probably available in Japan only) was used to broadcast these server conditions to all the people concerned. You can see keiko-chan in all her glory in the second picture. keiko-chan works great. But there’s one problem; The price tag. It is only after you pay $500 that you are able to enjoy the merits of server status broadcasting with rotating lights. The thought of building a LAN alarm light system with a Raspberry Pi was rather quick to come. So we went for it and built the first prototype, then a new prototype and at last a SMD version. For full details jump over to the Hack A Day website via the link below. If you enjoy building Pi projects you might be interested in our comprehensive list of Raspberry Pi displays, HATS and small screens. Or if you are interested in building Arduino projects these may provide inspiration for your next project.